The Vessel shall be equipped with two (2) Controllable Pitch Propellers and two (2) bow thrusters. It shall be built of steel and engine room is to be located in the middle. For further details see the relevant sections of this Specification. This vessel comply with SPS code 2008 and MLC 2006, and is an upgraded version of the 59 AHTS we build. The Vessel shall be equipped with two (2) Controllable Pitch Propellers and two (2) bow thrusters It shall be built of steel and engine room is to be located in the middle. ABS + A1(E), Offshore Support Vessel (AH, TOW, Supply, FFV 1, OSR-C2) + AMS, + DPS-1 +SPS. 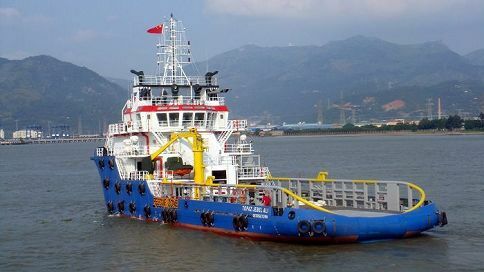 This vessel is high power offshore vessel with twin screw with controllable pitch propeller. One bow tunnel thruster and one bow retractable azimuth thrusters / one stern thrusters and two station controls in wheelhouse (Fwd & Aft).